Sold in November 2017, the 37.8 metre motor yacht Aquasition is back on the market, renamed Seament and listed for sale by Bob Cury at RJC Yacht Sales. Built in aluminium by US yard Broward Marine to ABS class and delivered in 2008 as a Broward 120’ model, Seament has modern interior styling by Evan K Marshall and high gloss cherry wood joinery by Genesis Design in Italy. Accommodation is for 10 guests in five cabins consisting of a main deck master suite, VIP suite, two doubles and a twin, all with entertainment centres and en suite bathroom facilities. In addition, there are quarters for six crewmembers aboard this yacht for sale. The main deck features a large main saloon and dining area, gourmet galley and a large aft deck with al fresco entertaining and dining for 10 guests. Her spacious flybridge offers a new custom Pipewelders hardtop, new Jacuzzi spa tub and granite surfaces throughout, along with a wet bar and barbecue grill. In January 2017, she received new furnishings and carpet in the main saloon and dining area along with custom window treatments, overhead panels and soft goods throughout the vessel by Architectural Interiors. She comes equipped with all the large yacht options to include twin Kohler 65KW generators, Naiad stabilisers, a bow thruster, Asea power convertor and much more. Twin 2,000hp MTU diesel engines give her a cruising speed of 20 knots, topping out at 22 knots. 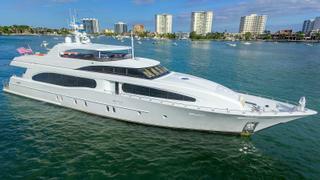 Lying in Fort Lauderdale, Florida, Seament is asking $6,995,000.